A friend told me that my council offered free cycle courses for anyone from a beginner up to fairly experienced. Not wanting to miss out on something free I sent off a few emails, completed a form and waited for the next available slot. Mine was at 10:30 this morning. It was a great day for it. Crisp, coldish but bright. My instructor, Roger arrived early and got a Moulton non-folder off the rack of his car. He also came to me and was waiting outside my door! He told me later on that he was 61 but I wouldn't have put him a day past 51. (Just shows what cycling on a small wheeled bike can do). I was told to cycle off and he'd follow. Very soon Roger identified that I didn't look back nearly as much as I should, especially when turning right. I have never noticed this but he was of course right. Apart from that he imparted some sound wisdom from many years of cycling and after about 40 minutes we arrived back outside my house. I must say to anyone reading this (hello to my one follower by the way!!) if you live in London and want some free cycling instruction for yourself or a member of the family, you could do worse than have a look on your councils website. Lots of councils off this for free as mine did and if you live further afield, well you never know, so have a look too. Is there anyone out there who keeps cycling, even in winter? Drop me a comment with some top tips for those of us new to all that the British winter can throw at us. i am folowing your blog. 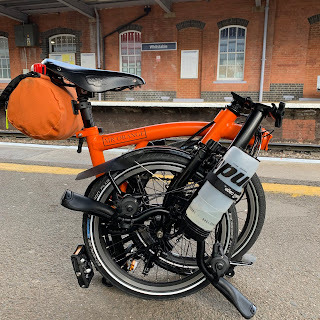 i wanted to tell you that while i visited london - last week- i took a maintanence course for bromp with cycle training uk. it was very good and it gave me confidence on taking the weels of and fixing a puncture.